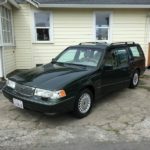 When we last left off, the LS3 powered Volvo was introduced along with the plan of attack. Things sat idle for a bit until space in the driveway cleared up from other projects (This is where the fingers typically get pointed at Joey). Once the back corner of the driveway was deemed vacant, the Green Machine was put into position. Willum decided he wanted to get a head start. Beginning Friday evening after work, he had the Volvo’s 6 cylinder out by Saturday afternoon. 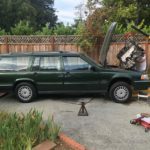 Surprisingly, the Volvo engine removal was fairly simple. 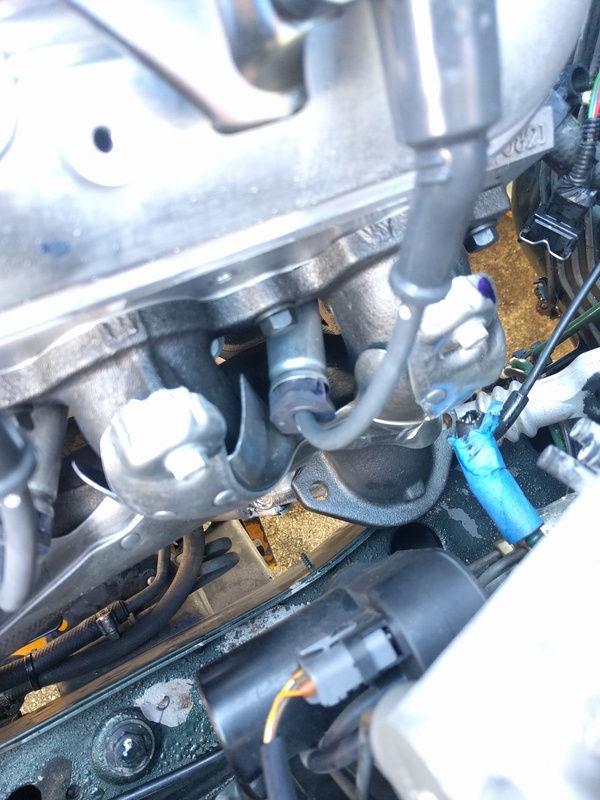 The engine harness is only connected by one large connector, and the driveshaft simply has a u-joint flange with nuts that need to be undone (unlike the rubber “guibo” flex disc found on BMW driveshafts). 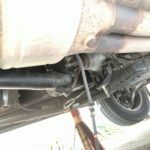 The only real hiccup that hindered engine removal was getting the auto transmission out of gear to rotate the driveshaft. 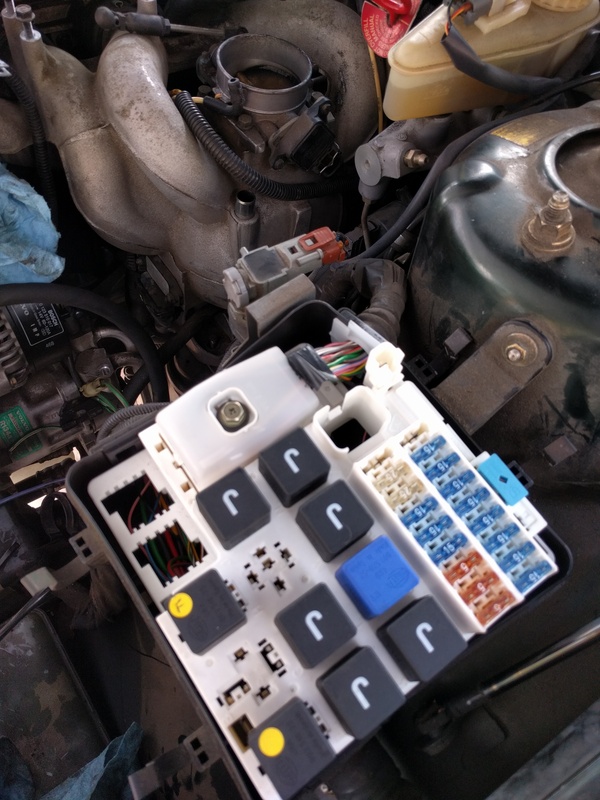 The Volvo uses a relay system to actuate the shift lock. 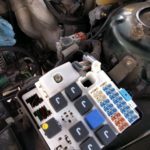 So if there’s no power to the relay, you can’t shift the automatic transmission out of park. 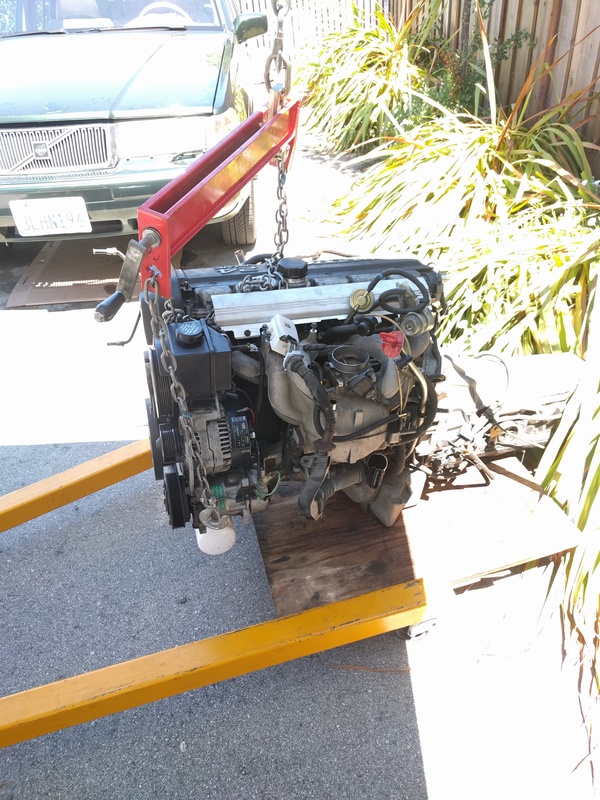 We tried to see if there was a manual override, but ultimately we had to put the battery back in the car and the transmission was free to shift gears again. 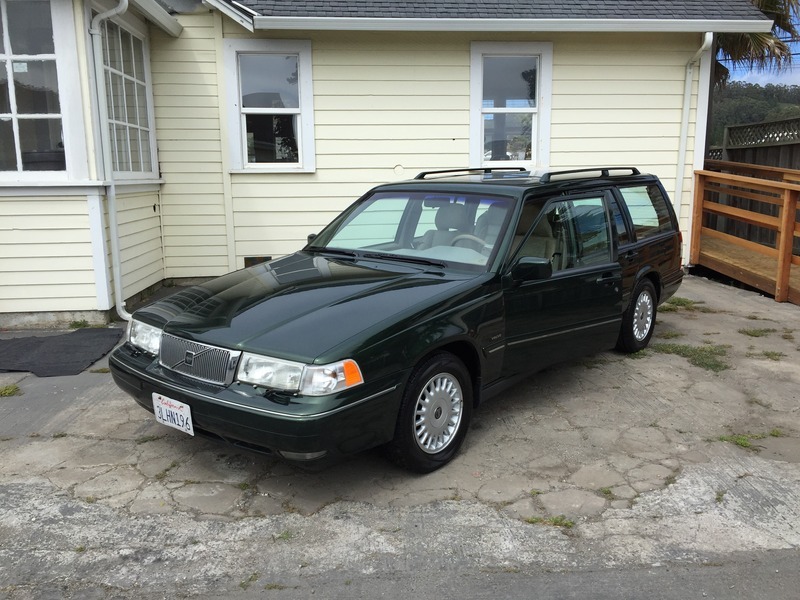 To be fair, the Volvo drivetrain is intuitively designed and there’s plenty of room to work on things. What a shame it has to go…oh well! Fresh detail before the storm. 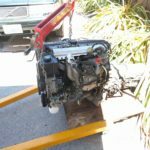 The inline 6 will be relocated after 22 years of living in the same spot. 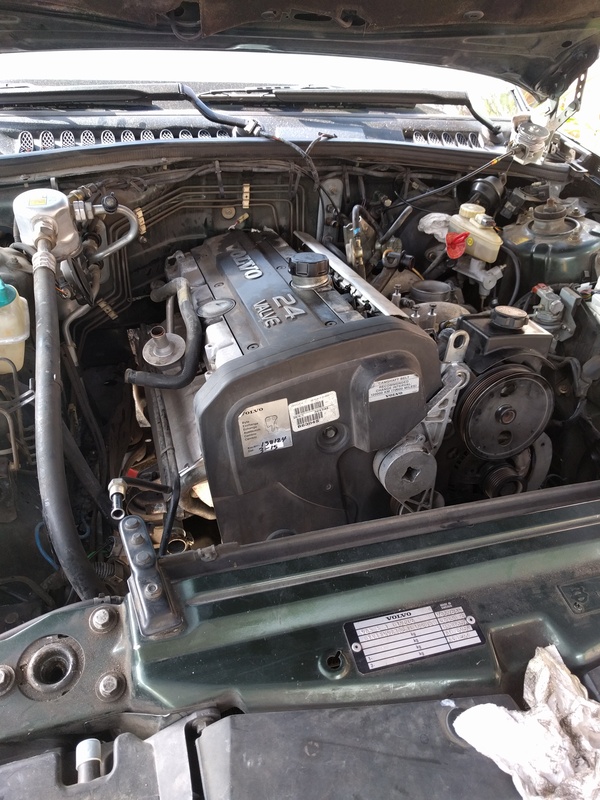 This is the junction between the engine harness and the chassis harness. Conveniently located at the fuse box. 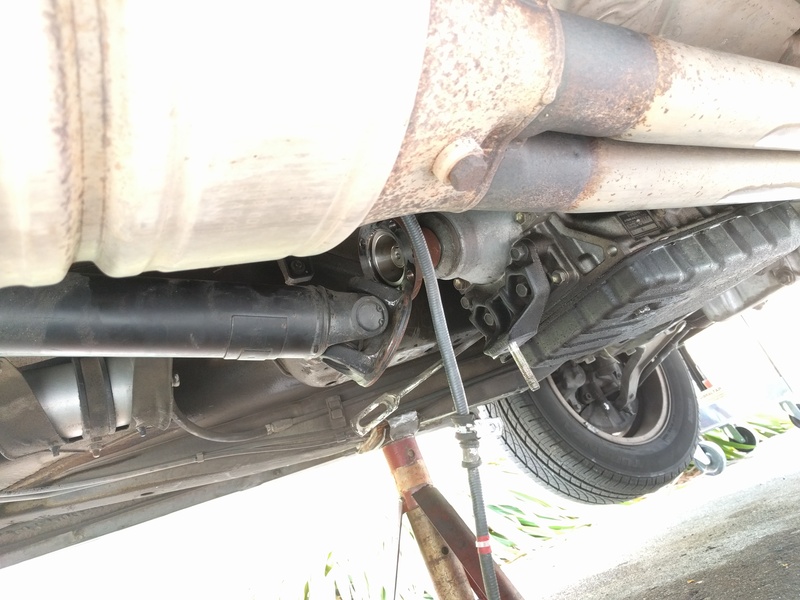 The drive shaft bolts to the auto transmission using a u-joint, no rubber flex disc here. Extraction in process. 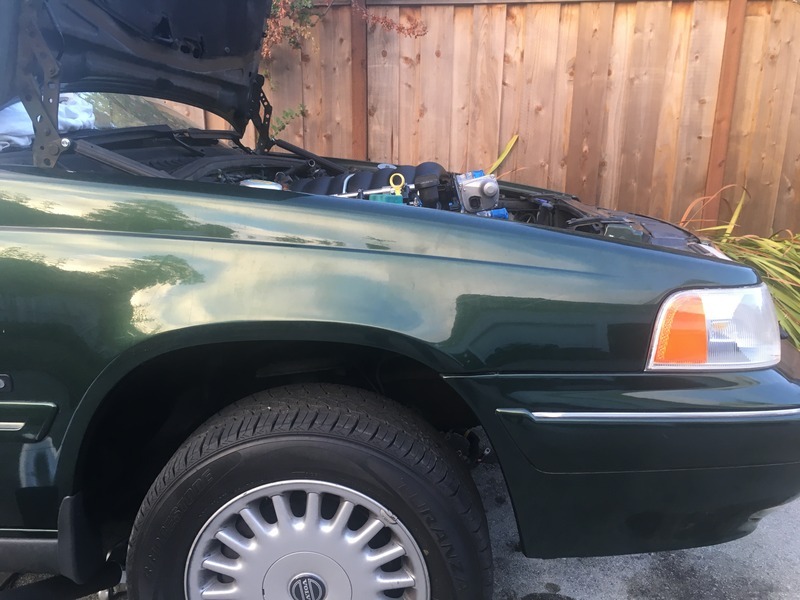 Note the hood is in the “service” position. Once the meager 200 horsepower six removed from its home, out came the king of ultimate clean: the power washer. 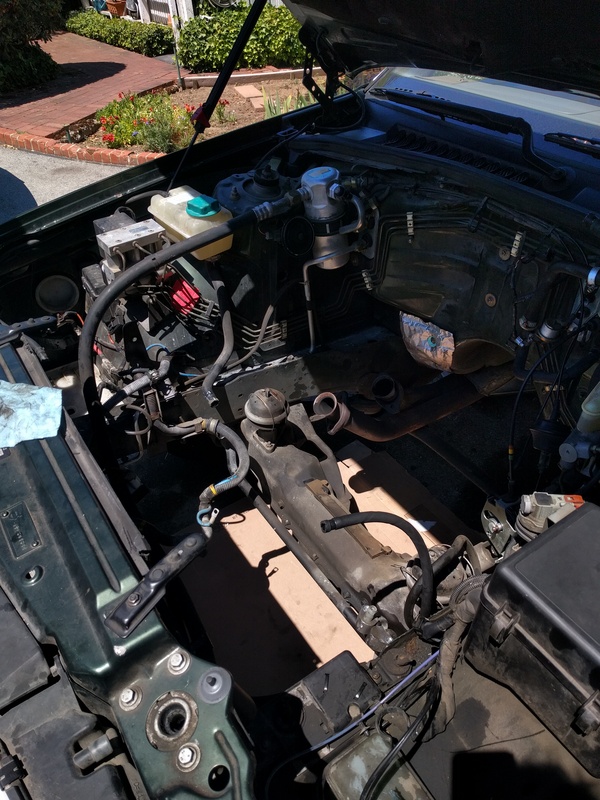 For 22 years of being untouched, the engine bay wasn’t as grimy as one might expect, but no harm making the new work area spotless. As Bruce likes to point, nothing can ever be too clean, and more importantly, you can never have enough anti-seize. Now it was time to roll the E-Rod out of the garage and prep it for a test fit. 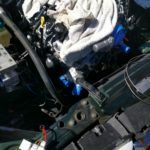 The first order of business was to get bell housing bolted up to the back of the engine, that way we would know whether the firewall will have to be pounded out. 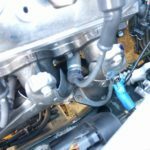 With the bell housing bolted up, we attempted our first plunge into the engine bay. Immediately we noticed two major issues. 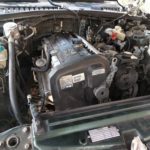 The first being the motor sat at least 1.5 inches too high, and the other major hurdle being the rear dump headers wouldn’t clear the steering shaft. 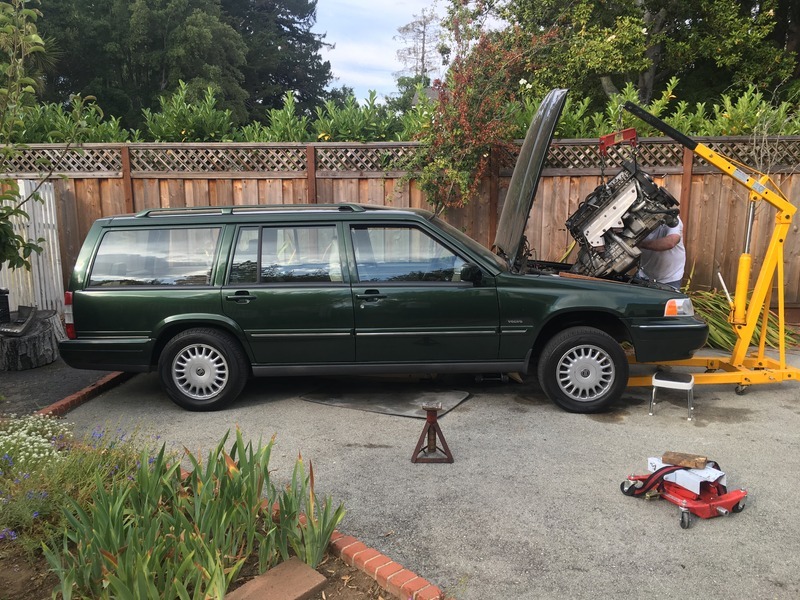 Just as quick as the engine went in, it was back out of Volvo. Talk about a tease. 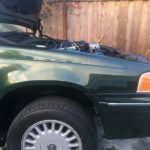 An empty engine bay means time for the power washer! If you look closely, you can see the pedestals the stock engine mounts rest on. Time to get down to brass tacks. 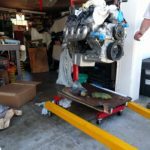 Having experience with installing a V8 into the e30, we had a strong suspicion the Camaro headers wouldn’t clear the steering linkage, so in our infinite wisdom, a set of Corvette center dump headers were purchased as a backup. 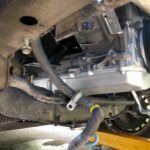 The next day Will swapped out the E-Rod’s supplied headers with the Corvette versions. Since they’re both made for the LS3, they share the same mounting flanges. We gave it another go and lowered the Chevy engine back into the bay. The header swap seems to have solved our clearance issues, but the motor was still sitting way too high and mighty. 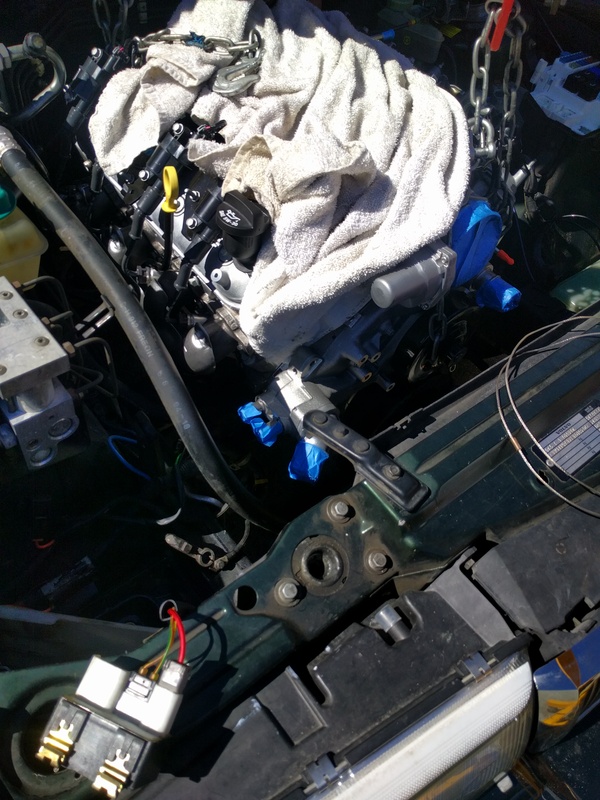 When using the V8Volvo.com LS swap engine arms, they are supposed to be used in conjunction with stock e36 M3 rubber motor mounts. 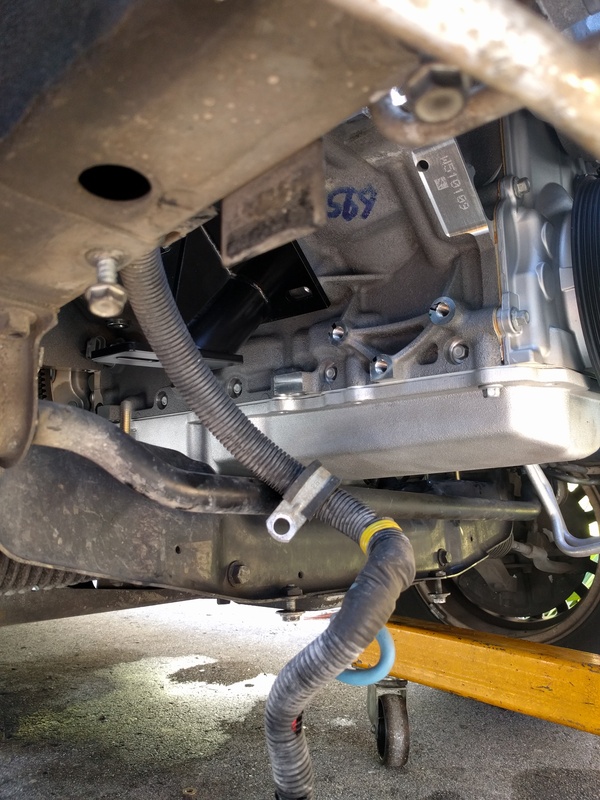 On the Volvo 960 (and other long wheel base RWD Volvos as far as we’re concerned), the stock engine mounts sit on a pedestal that’s about 2 inches tall, so that’s means there’s a 2 inch gap between the rubber engine mount and the Volvo’s front subframe. 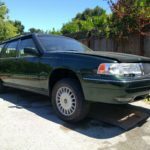 Will managed to get in touch with guy that produces the conversion mounts, and was told that no modification was necessary using Volvo 740 mounts. We could either modify the motor arms by sectioning and shortening them, or the smarter approach would be to find a set of the 740 pedestals. I think you can see the route we’re going to take. Checking the Holley oil pan clearance with and without the motor mount pedestals. The steering linkage says the rear dump headers aren’t happening. While it may seem that we’ve made more of a mess than any progress, I think we’ve made good strides. 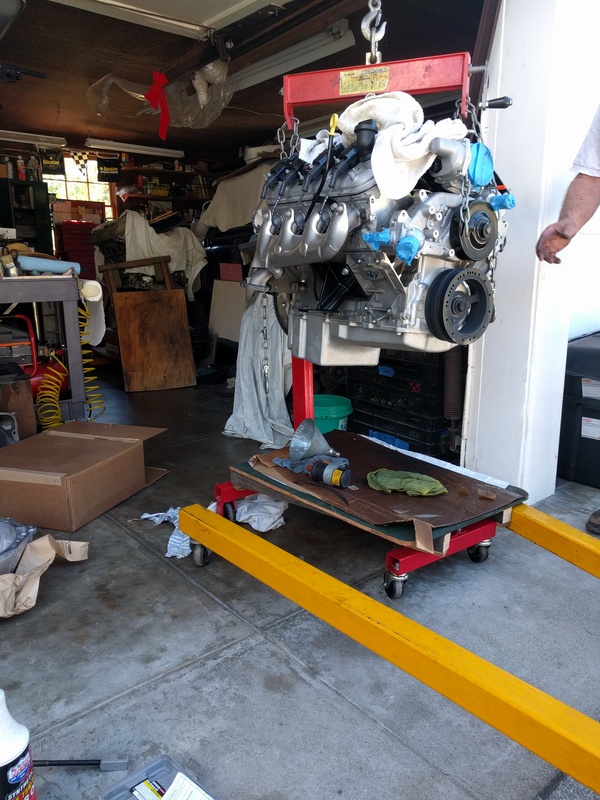 We’ll definitely need to test fit with the motor again with the 740 pedestals before we can really get into installing the engine. 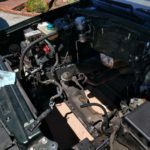 In the meantime, we have the manual transmission pedal assembly to get installed, and there’s no better time to attack that project then when the motor is out of the car. 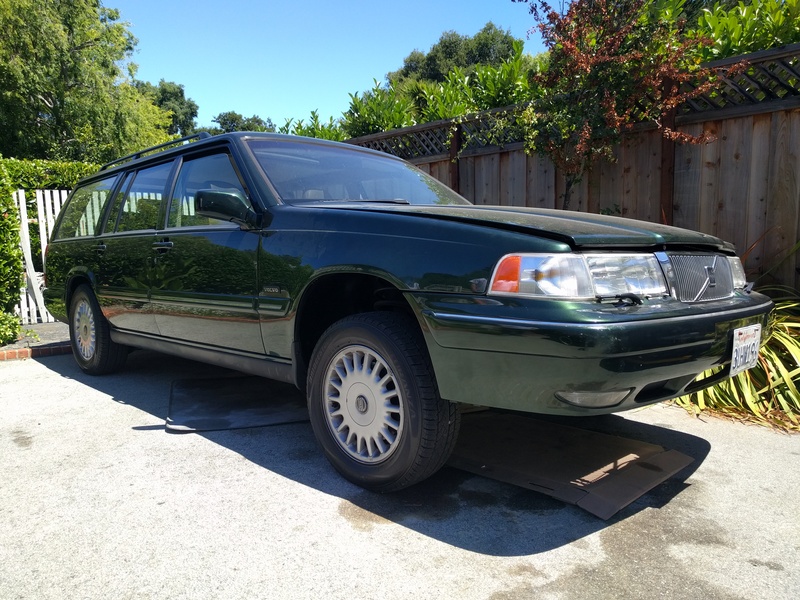 At least the addition of an extra pedal should deter the rest of the fam-bam from accidentally driving the Volvo to the local farmers’ market. Then again, we wouldn’t want those fresh strawberries to spoil because we couldn’t get home time. How else are you supposed to get your daily dose of Vitamin C if there’s no orange juice left? You see, we’re thinking ahead.